Ohio senior A.J. 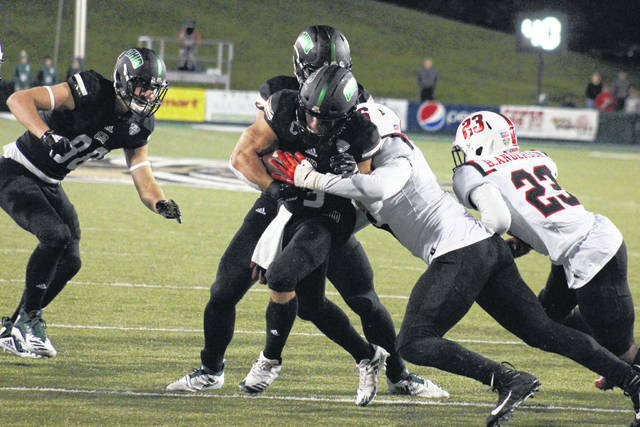 Ouellette breaks a tackle on his way to the end zone, during the Bobcats’ 52-14 victory on Thursday in Athens, Ohio. 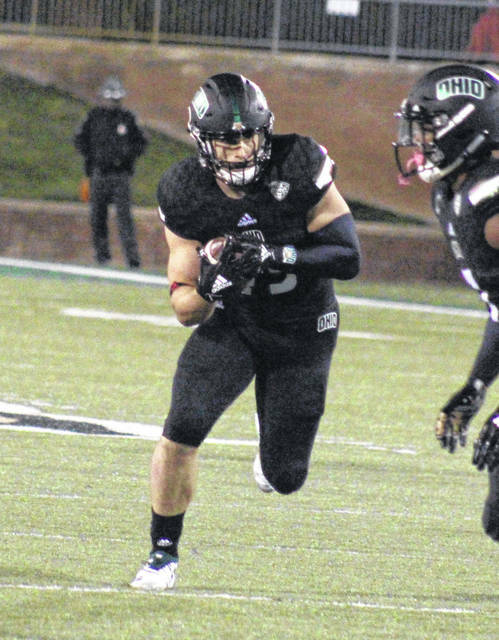 Ohio sophomore Jared Dorsa returns the ball after an interception, during the Bobcats’ 52-14 victory over Ball State on Thursday in Athens, Ohio. 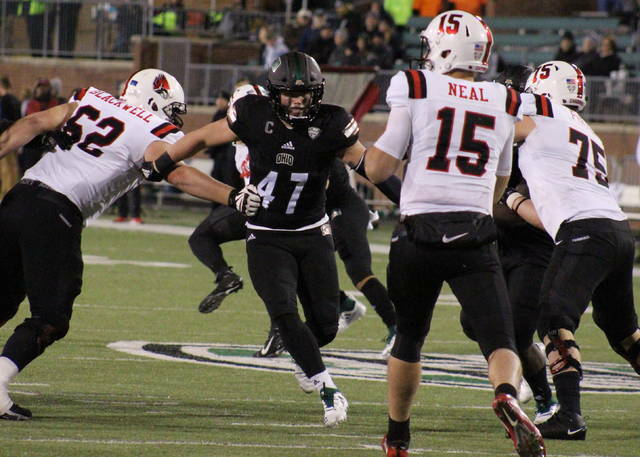 ATHENS, Ohio — The Cardinals scored first and scored last, but everything in between belonged to the Bobcats. 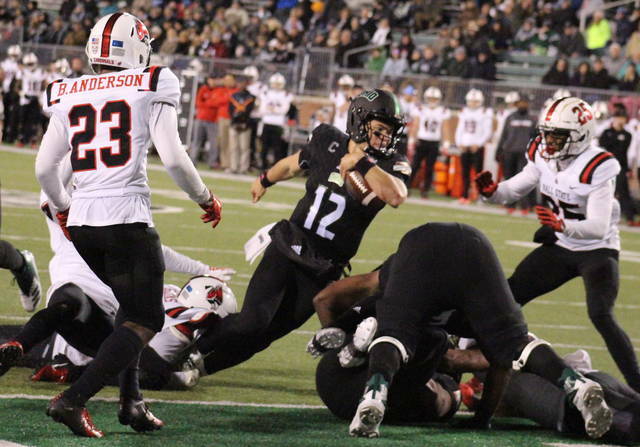 The Ohio football team followed a 31-point second quarter with a 21-point third quarter on Thursday at Peden Stadium, as the Bobcats defeated Mid-American Conference guest Ball State by a 52-14 tally in OU’s annual Blackout Game. Ohio (5-3, 3-1 MAC) began the game on defense and forced the first of six three-and-outs by Ball State (3-6, 2-3). The Cardinal defense also came up with a three-and-out on its first try and then claimed the game’s first takeaway on its next attempt, as Christian Albright intercepted a pass at the BSU 48. Seven plays later, Ball State broke the scoreless tie as, Riley Neal found Riley Miller for an 18-yard scoring pass. Morgan Hagee made his first of two-point after kicks to make the Cardinal lead 7-0 with 4:06 left in the first. Ohio was held scoreless in the first quarter for the first time this season, but scored on the first play of the second, as Maleek Irons found paydirt on a six-yard run. Louie Zervos made his first of seven point-after kicks to tie the game at seven, capping off an eight-play, 70-yard drive with 14:54 left in the half. Exactly five minutes later, Zervos gave the Bobcats the lead for good, making a 23-yard field goal to cap off a nine-play, 54 yard possession. 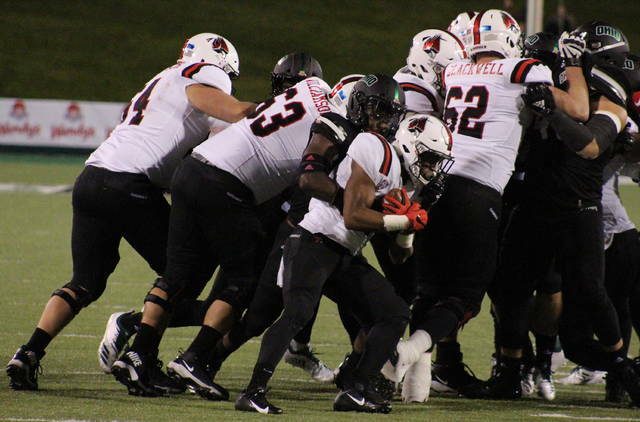 The Bobcat defense came up with its first takeaway on the ensuing Ball State drive, with Marlin Brooks forcing a fumble, and Dylan Conner recovering at the BSU 40. On the fifth play of Ohio’s possession, A.J. Ouellette gave the hosts a 17-7 lead with a nine-yard touchdown run through the middle of the Ball State defense. Following a BSU three-and-out, Ohio went 56 yards in eight plays, with Nathan Rourke rushing in from two yards out to make the Bobcat lead 24-7 with 1:23 remaining in the half. Ball State punted back to Ohio with 31 seconds left on the clock, enough time for the Bobcats to put seven more points on the board, with Rourke finding Andrew Meyer for a 21-yard touchdown with two seconds to spare. DL Knock recovered a fumble for the Bobcats on the ensuing kickoff and Ohio headed into the half with a 31-7 advantage. OU began the second half with a 10-play, 74-yard drive, with Rourke delivering the touchdown on a three-yard run with 9:42 left in the third. Just 1:27 later, Ohio’s lead was increased to 45-7, as Ouellette broke a 44-yard touchdown run. Next, the Bobcat defense earned another takeaway, as Jared Dorsa picked off a pass and returned it 16 yards to the BSU 11. Four plays later, Irons scored Ohio’s final touchdown, on a one-yard run. Ball State ended its night on a high note, as quarterback Drew Plitt — who came in for Neal after a second quarter injury — rushed in from nine yards out with 2:53 to go. After his 102nd win with the Green and White, 14th-year head coach Frank Solich was thrilled with his team for a second time in six days. Ohio earned a 30-to-11 edge in first downs in the win, along with a 554-to-242 advantage in total offense. The Bobcat rushing game totalled 411 yards on 57 carries, the team’s first time over 400 yards on the ground since a 2005 bout with Ball State. The Bobcats’ six rushing scores were their most in a game since 1997 against Eastern Michigan. 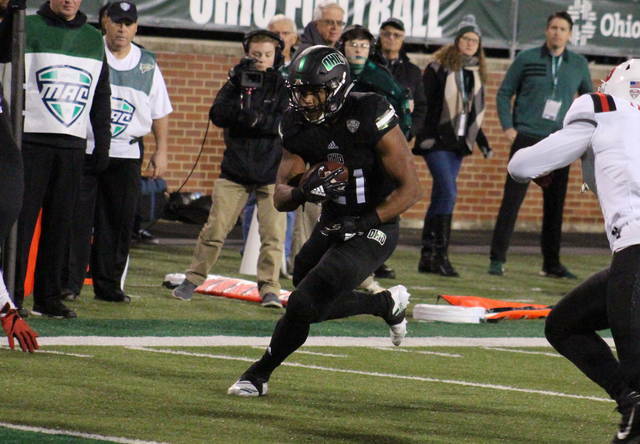 Solich acknowledged that while the majority of the offense was showcased, the Bobcat receiving unit seemed to be left out of the fun. The Bobcats won the turnover battle by a 3-to-1 tally, and punted just once, while BSU punted eight times. Ohio also earned a 17:42 advantage in time of possession. Solich noted that the Ohio defense is playing at its best of the season. Ohio’s offensive output was led by Ouellette and Irons, earning 135 and 102 rushing yards respectively, with a pair of touchdowns apiece. Ouellette also added a pair of receptions totalling 18 yards. Rourke rushed eight times for 77 yards and two scores, while completing 11-of-19 passes for 127 yards and a touchdown. David Burroughs carried the ball seven times for 50 yards, while Jake Neatherton added 38 yards on 10 tries. Quinton Maxwell was 1-of-3 passing for 16 yards and gained nine yards over a trio of runs. Meyer led the Bobcat receiving unit with four receptions for 50 yards and one touchdown. Papi White caught three passes for 35 yards, Cameron Odom added two grabs for 16 yards, while Isiah Cox hauled in one 24-yard pass. Javon Hagan led the Ohio defense with five tackles, while Ilyaas Motley earned a team-best two tackles for a loss, including one sack. For Ball State, Plitt was 9-of-17 passing for 86 yards, while rushing six times for five yards and a score. Neal was 7-of-15 passing for 76 yards and a touchdown, to go with 20 yards on a trio of carries. James Gilbert led the BSU rush attack with 52 yards on nine tries, while Justin Hall led the team in receiving with four catches for 42 yards. Ball State still holds a 15-10 record in the all-time series against Ohio, despite falling to 2-4 against the Bobcats in the Solich era. Ohio is on the road for its next two games, starting with a trip to Western Michigan on Thursday.